212-920-6270 | Make Restaurant Reservations | Order Now! 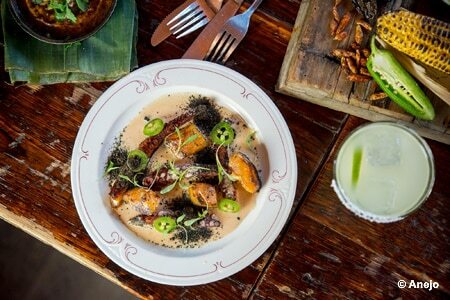 Contemporary TriBeCa Mexican restaurant offering elevated versions of south-of-the-border classics. : Brick walls painted here and there with whimsical designs and overhanging chandeliers add an element of chic to the otherwise rustic setting at this TriBeCa Mexican restaurant. The menu focuses on elevated versions of south-of-the-border classics --- think guacamole with tomatillo, pumpkin seeds, pomegranate and chipotle. Extra-large crispy tortillas dusted with spices are equally good as accompaniments or as a standalone starter. The carne asada torta is filled with chopped grilled hanger steak, avocado crema, Oaxacan cheese, oyster mayonnaise, seasoned cabbage and baked beans. Sides like the Brussels sprouts with Berkshire pork sausage, crispy sprout leafs and garlic are full of earthy flavors. Tres leches for dessert is inventive with the addition of ice cream and cotton candy crunch. Tequila varieties range from the classic to the Blanco, and there's an entire margarita menu. For brunch, "Morning Tacos" are stuffed with scrambled eggs, braised pork and chorizo hash, and blueberry corn pancakes arrive topped with fresh fruit and warm maple syrup.